And Law's loud thunders rock the ground. With gnashing teeth retire from view. * The Alien, and Sedition Law. This reminded me again of how much more polarized American politics was during that "reign of witches" — but mostly I wondered whether the Connecticut Courant's Federalist versifier was accusing the United Irishmen and French Jacobins of being potheads. But after a moment's thought, I realized that the phrase "hemp-devoted head" was a threat of hanging rather than a reference to cannabis consumption. And sav'd two halters to the State. Have the meanings of "dismal" and "awful" changed since 1798, or is the author intentionally trying to make the Acts sound scary for those who oppose them? @Anschel: “Awful” has changed. It used to mean “that strikes with awe; that fills with profound reverence” (Webster's 1828 Dictionary). I remember singing as a child, “Before Jehovah's awful throne”; most hymnbooks now have "awesome”. I don't think “dismal” has changed so much. Webster's 1828 Dictionary has “dark, gloomy; sorrowful, dire, horrid, melancholy, calamitous, unfortunate; frightful, horrible”. The meaning “pitifully or disgracefully bad” is more recent. Johnson (1756) defines dismal as "sorrowful; dire; horrid; uncomfortable; unhappy." Too is a typo for two, I think. And purg'd the chequer'd Nomination. and sate, as tho' on chesnut burr. Could raise in Heaven a revolution. Congress awoke, and star'd around. And Georgia, and New-Hampshire join. Orations, Sermons, Prayers, and Songs. Relumes the fire of martial rage. In bloom eternal shall be seen! Of virtue, and her own repose. The storm should hurl him to his fate! Another example of the older meaning of "awful" comes from one of Purcell's cantatas, in which, after an aria sung by a bass representing some god (Poseidon, I think), the tenor responds "I hear your awful voice". There have probably been too many modern performances in which these word seem painfully appropriate. It's the term "Alien Friends Act" I find odd. Does anyone know why that became the unofficial name of An Act Concerning Aliens? I too wondered at "Alien Friends Act," having never encountered it before. 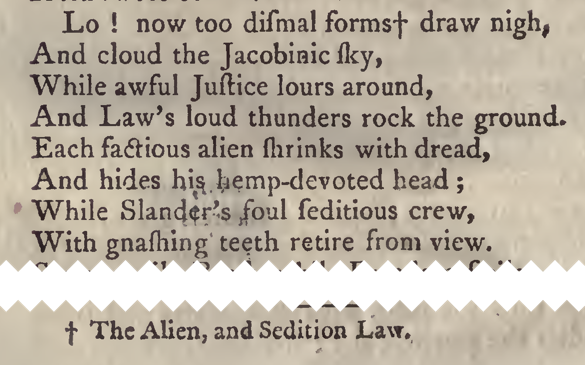 Wikipedia (of course not authoritative, but still…) report that there were four Alien and Sedition acts–the second of which was the Alien Friends Act. The Alien Enemies Act came after. Perhaps "Friends" is an early example of spin. It seems a reasonable name in contradistinction with the Alien Enemies Act, which was enacted alongside it. The Alien Enemies Act related to aliens from "enemy" nations whereas the Alien Friends Act related to aliens from "friendly" nations. Ah, "friendly" nations, that's the connection, of course! Thanks, I was focusing on "why would you want to expel your friends?" Along with "awful," "wonderful" seems to have undergone a similar transformation. I just came across a poster for the film of The Jungle, which touted it as "Sinclair's wonderful story of the beef packing industry." I thought the Alien Friends Act was a vaudeville crossover sketch starring David Schwimmer and Sigourney Weaver. "Wonderful" meant "causing wonder." So a wonderful story might be a made-up story. A nice double-entendre usage is L. Frank Baum's "The Wonderful Wizard of Oz." Fantastic was similar – it meant pertaining to a fantasy. If something was fantastic, it might be the product of a deluded mind, or it might just be a lie. And unbelievable, of course, meant something that was obviously not true. We can see the same process underway in real time with "ridiculous." And if there were four Alien and Sedition Acts (I've always assumed that there was one each), then it must be "too." It's not needed but it helps the scansion. One amusing thing about old bad verse is that it almost always scans and rhymes – unlike modern bad verse, which never does either. The rhyme impart/subvert in the first stanza struck my eye. Did these actually rhyme in 18th-century America, or is this just a fossilized rhyme like those found in a multitude of 19th-century hymns?